Audit trail provides you with a full history of your digital signage network. It has the ability to access and supervise all actions performed. UCView introduced audit trail for better management of your digital signage system. An electronic audit trail provides a detailed history of your digital signage operations. The audit trail will record any data that was entered and activities that have been affected during any user operation. An audit trail can help a digital signage network administrator keep track of what users accessed and changes made to data. For security purposes administrators can view who had access to the system, what actions were performed, and the date and time it occurred. It is an essential feature for any type of digital signage network. Audit Trail in digital signage can be used in corporations, banks, educational institutions, medical facilities, etc. 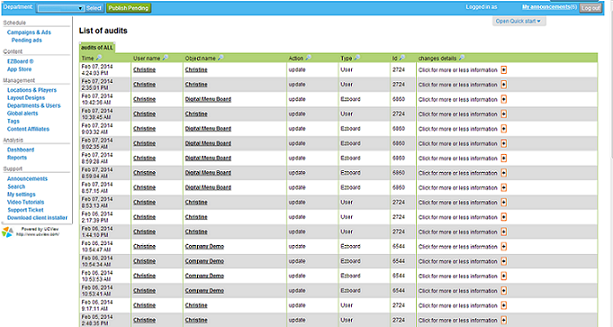 Audit trail runs in a privileged mode, meaning that it can access and supervise all actions performed by users. UCView Audit Trail provides optimal security protection and control, for a safe and trouble-free operation of your digital signage network!